McDonough restaurant is one of five locations planned for the metro-Atlanta area. Cowboy Chicken, a Dallas-based rotisserie franchise chain, is opening its first Georgia restaurant Monday, Sept. 3. The McDonough restaurant, owned by Chrystal Jakes, wife of former NFL player Van Jakes, is hosting a weeklong Grand Opening Celebration Sept. 24-28. “I’m beyond excited to finally be bringing the fantastic wood-fired flavor of Cowboy Chicken to McDonough,” Jakes said in a prepared statement Thursday. Monday, Sept. 24: The first 100 guests waiting in line when the restaurant opens at 11 a.m. are entered into a drawing, and five lucky winners receive free chicken for a year. Must be 18 or older to win. Tuesday, Sept. 25: All day long, 25 percent of proceeds are donated to the Stockbridge Youth Council to support their trip to the National League of Cities' City Summit in Los Angeles this November. Wednesday, Sept. 26: Cowboy Chicken is taking guests back to 1981--the year the restaurant first opened--with original menu pricing on select items. Dine-in only. Thursday, Sept. 27: All members of law enforcement, firefighters, EMTs, nurses, doctors, and active and veteran military personnel receive 50 percent off all dine-in purchases. Must present badge or proof of profession. Friday, Sept. 28: All guests dining in the restaurant and wearing Eagle’s Landing High School swag or apparel will receive a free cobbler with the purchase of an entrée. Dine-in only. Cowboy Chicken McDonough, at90 South Point Blvd, occupies a new 2,800-square foot space with seating for up to 144 guests and serves lunch and dinner daily from 11 a.m. to 9 p.m.
More Atlanta-area locations are in the works. 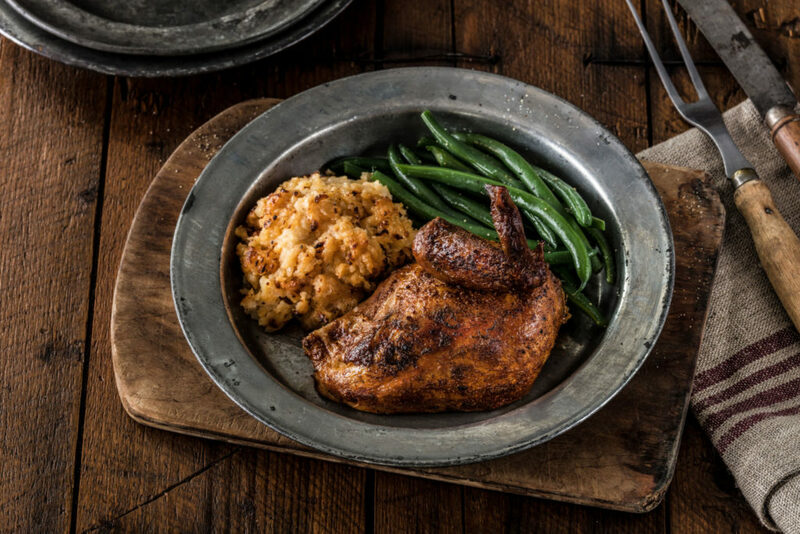 Under Jake's company CBJ 22 Consulting LLC, the restauranteur has signed a five-store franchise agreement to bring the Cowboy Chicken brand to Atlanta and surrounding areas. string(34) "90 S Point BlvdMcDonough, GA 30253"
Why just Eagles Landing High School gets free cobbler?